Very few people walk down the aisle with the expectation of pending divorce. Yet only 52% of women will see their first marriage reach its 20th anniversary. The odds of experiencing this life catastrophe are high. But unless you’ve got money coming into a marriage and drafted a pre-nup, we do almost nothing about it. Most of us do nothing to financially protect ourselves. To give you some perspective on the numbers, here are some things we do tend to financially insurance against–along with the odds that they will actually happen. The odds that your household will experience a fire bad enough to report is 25%. Yet we insure against this risk with homeowner’s or renters insurance. The average State Farm auto policy holder gets into an accident once every nineteen years, making the odds admittedly higher than divorce in a first marriage. You’re about half as likely to get divorced in the first 20 years of that marriage than you are to get in a car accident in 19. Still, we insure against auto crashes. If you’re an American woman, your current odds of dying between ages 15 and 60 are 7.4%. Yet how many of us carry life insurance? We insure against all of these instances of tragedy or inconvenience, yet only one of them is more likely to happen than divorce. Sure, you can get a prenup to guard against future financial disadvantage, but for most people that’s not reasonable or necessary. Instead, you can just keep all of or a portion of your finances separate throughout your marriage. This allows you to maintain your own savings, and prevents the other person from absconding with money out of a joint account should the worst happen someday. There’s many different ways this can work. Here are just two of them. Keep everything in your name only. Bank accounts. Car loans. Etc. And have your partner do the same. If you’re going to have a marriage with separate finances, it doesn’t have to be contentious or self-guarding. You can still work together towards financial goals, budget together, and talk about money transparently and openly while keeping everything legally separate. In community property states some of your accounts may be up for litigation anyways. But the barrier of litigation is still better than someone legally just up and leaving with all the cash. Some couples opt to have their own accounts for things like personal savings, personal spending and birthday/anniversary surprises. Their paychecks are deposited here. But then they send some of that money to a joint account every paycheck. This joint account covers things like the mortgage/rent, groceries, kids’ activities, etc. You can split these costs 50/50 or work out a different ratio that makes more sense for each spouse’s respective income. Some argue that if you can’t trust each other with money, you shouldn’t be married. I agree with this. You should be able to talk about money matters and work together towards financial goals. But some take the argument even further to say that having separate finances is a protectionist move that demonstrates an inherent lack of trust. To this point I argue. First of all, taking a rational look at the statistics, it’s not about not trusting your partner; it’s about a rational mistrust of long-term relationships in our culture. You have to trust the data rather than your current feelings in the moment. Second of all, just because you have separate finances doesn’t mean you don’t trust each other. In fact, I view it to be just the opposite. When you trust each other enough to believe the other partner will follow through on the money moves you have discussed and budgeted for together–even though you don’t have access to their bank account and can’t touch the money yourself–you’re demonstrating the exact definition of trust. But we’re never going to not be in love. I really hope you’re right. But so, so many people before you have thought the exact same thing and ended up divorced. 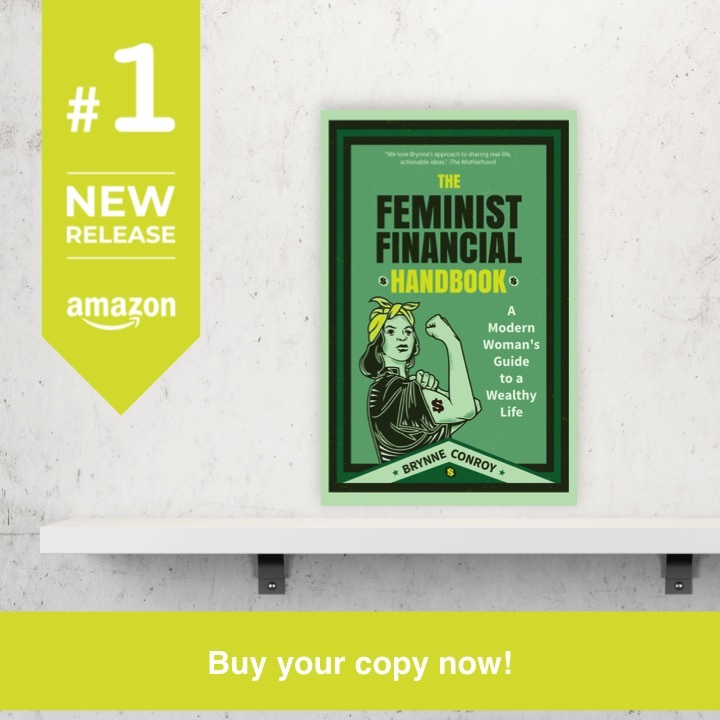 Women in particular tend to end up on the short end of the financial stick. They’re more likely to have cut back their careers to support the marriage, have gaps in their resume, and are often thought of as adversarial (even when they’re not) by a judicial system that is dominated by male officials. If you’re reticent to believe me, I’d highly encourage you to research Terry Hekker’s story. At the end of the day, we can’t let our feelings cloud our judgement. The numbers show a statistical likelihood of relationship breakdown that can’t be ignored. We wouldn’t ignore those numbers if we were talking about car accidents. We wouldn’t ignore those numbers if we were talking about house fires. We wouldn’t ignore those numbers if we were talking about death. It’s financial folly to ignore these numbers simply because we’re in love. This is a part of the Personal Finance Pro/Con Series organized by PeerFinance101. You can read the opposing view here. This entry was posted in Family Finance, Wedding on a Budget on January 12, 2018 by femmefrugality. When I was expecting, my then-boyfriend/would-be husband and I talked about getting married. We talked about all the different ways it would impact us from taxes to the fact that I was already overwhelmed enough and didn’t want to walk down the aisle pregnant. We also talked about engagement rings. He wanted to get me something really nice, so he wanted to save up for it. He also told me he didn’t want to get me a diamond. He pointed to a Leonardo DiCaprio movie sitting on the bookshelf. I pointed out that there were ethical ones, and he pointed out that you can’t be sure that the sourcing of the stone wasn’t lied about somewhere along the way. They very easily could have come from slave labor or horrific working conditions or child miners. Or a mix of all three. Eventually, he ended up deciding that he’d try to buy ethical, but he did want to buy a diamond. He thought that everyone would judge him for the rest of our lives because his wife didn’t have a diamond on her finger. I told him that was stupid, but this was his thing. So I let it be. He was told the ring was ethically sourced–that conflict-free was the only way the jewelry chain rolled. But we still don’t really know. It’s incredibly uncomfortable to think about. More than uncomfortable. What we didn’t know then was that there actually is a way to be sure you’re getting a conflict-free diamond. You can do it by making sure your stone is a CanadaMark. 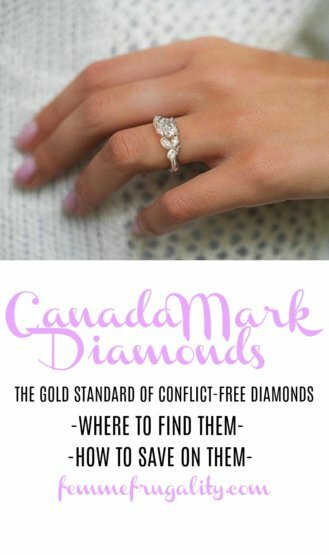 Where do CanadaMark diamonds come from? There are two CanadaMark diamond mines in the Northwest Territories of Canada. The stones are mined by workers who make a fair wage. CanadaMark works with the local communities–many of whom are Aboriginal and have a knowledge of the land like none other–to make sure they’re mining in sustainable ways, and taking care to bolster the environment rather than destroy it. They also give back some of their profits to these communities through literacy, education, and health/wellness programs. Yeah, but how do I know that’s where my diamond actually came from? Fair question. This is an industry where tracking is always in question. That’s why CanadaMark diamonds are literally stamped with a serial number. Each stone is tracked and verified by independent auditors–from mine all the way to polishing. Okay…where do I get my ethical diamond? CanadaMark only works with select retailers. I’m a big fan of shopping online as it can save you over fifty percent compared to shopping brick-and-mortar, but they only work with one online retailer. 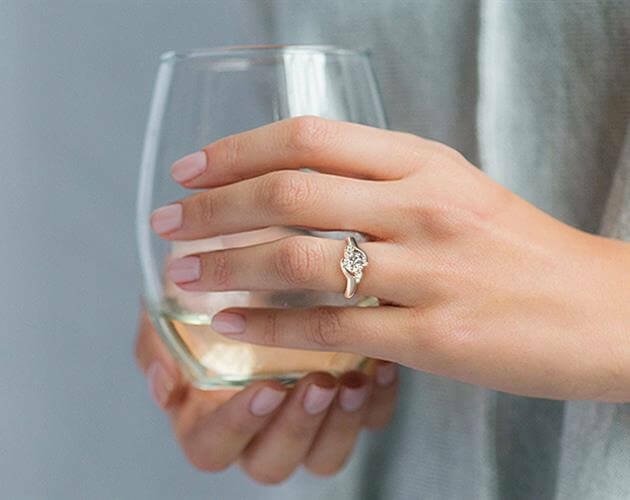 If you’re going to shop online, you can find CanadaMark diamonds exclusively at James Allen. Otherwise, you have to go brick and mortar and risk paying a marked up price. 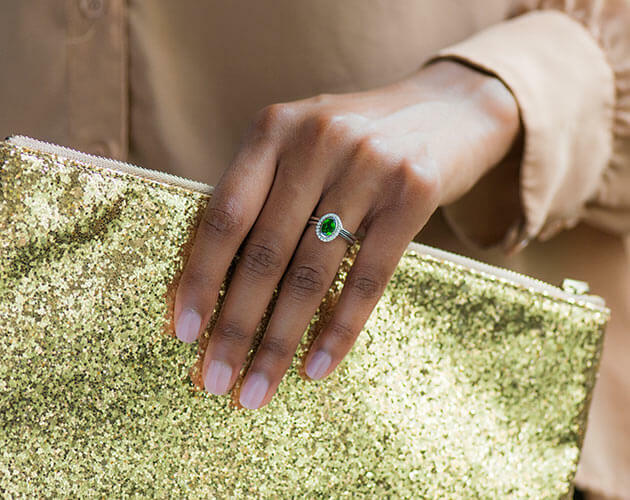 Just because you’re going ethical doesn’t mean you can’t save money on your engagement ring purchase. 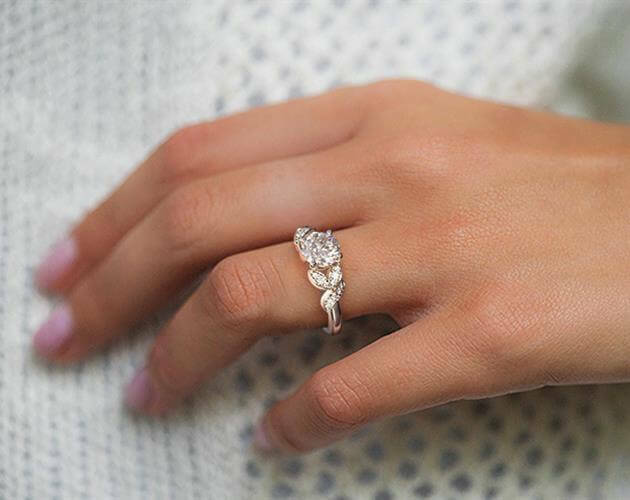 By being smart about carat size, color and clarity, you can get her a gorgeous, ethical ring at a lower price. Here’s the deets on how to make that happen. Currently, James Allen is running a sale of 25% off your purchase for Black Friday. If you can’t get your money together before the end of the sale, come back. I’ve been watching them for a few years now, and they have great deals throughout the holidays. Twenty-five percent is a pretty huge one, but I’m willing to bet you’ll run into another sale if you’re still trying to get your stuff together. But how do I really know? The serial number is great, but only if you can verify it. Get the diamond’s history. Certify every single time it changed hands. Luckily, you can do just that. Before you purchase the ring, you can look at the certificate on James Allen’s site. You’ll find it under the image of the diamond. You can take the serial number and carat weight and verify it with CanadaMark before you even purchase. After you purchase the ring, you’ll be able to enter the serial number you see on the stone using the online verification code. It will be the same, but it’s always good to check. To top it all off, James Allen has a 30-day, 100% money-back return policy—no reasons or justifications required. They even pay for return shipping. In the unlikely event you aren’t satisfied with your purchase, you can simply return it hassle-free. Did you purchase a conflict-free diamond for your engagement? What was your experience like? Do you still have concerns like I do, having not purchased a CanadaMark? Let me know in the comments! 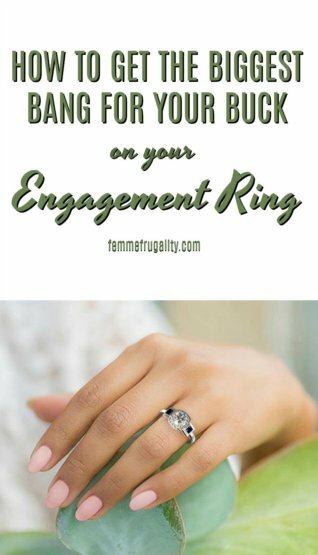 This entry was posted in Wedding on a Budget on November 24, 2017 by femmefrugality. Engagement ring shopping isn’t something you do everyday. If you’re lucky, you do it once in your lifetime. If you’re brave enough to move on after a failed first attempt (been there,) you might do it once or twice more. But it’s not a shopping muscle we flex on a regular basis like groceries or cell phone providers. It’s something we really have to research if we want to do it right. Luckily, we live in the age of the internet, which allows us to access insider information like the following money-saving tips from Oded Edelman, co-founder and CEO of James Allen. James Allen is an online jeweler with a ten-year history of bringing customers beautiful, conflict-free diamonds at a fraction of the price of brick-and-mortar retailers. Here are Edelman’s top three savings tips. “Typically brick and mortar retailers have entirely different cost structures thanks to holding inventory, overhead costs, etc,” says Edelman. He notes that these cost structures may result in higher costs for the end consumer, and that by shopping at online retailers like James Allen, you can save up to 50%. Most diamonds are going to come in standard carat sizes. For example, you might find a 1.0 carat diamond or a 1.5 carat diamond. You want to get a nice ring, and you can do it without breaking the bank. In fact, Edelman notes that the best way to achieve optimal value is by shooting for slightly lower than optimum color and clarity. These differences are minuscule–most of the time they’re not visible to the naked eye. But they make a huge difference to your wallet. Color. Shop for rings with slightly lower colors–in the G to J range. Clarity. Shop for rings with slightly lower clarity–in the SI1 to SI2 range. “They can cost half as much of high color/high clarity options, without any visible sacrifice in beauty,” says Edelman. Now is a great time to shop. At least for customer-centric online retailers like James Allen, you’re going to find the most sales at this time of year—October through February. Here’s why. Find any of these tips helpful? Use different methods to save on your engagement ring purchase? Leave your story in the comments! This entry was posted in Ways to Save Money, Wedding on a Budget on November 3, 2017 by femmefrugality. Today’s couple is less likely to want consumer goods as wedding gifts. Millennials are getting married at an older age, and have often established households prior to the wedding–whether that be on their own as individuals, or as a couple. That means as you attend weddings, you’re more likely to catch a hint that the couple is looking for something else in lieu of that department store registry. That “something else” is cash. Gifting money for a wedding can be a touchy subject, though. How much do you give? Do you make the check out to her maiden or married name? Wait, is she even taking her fiance(e)’s last name? How much money should I give as a wedding gift? Many couples today have cash registries. You may get a URL in your wedding invitation. Once your on the site, there will likely be cutsie things you can “pay” for like the honeymoon suite, airline miles or dinner at a nice restaurant. These are things the couple has likely already paid for, but it’s a polite way of asking you for cash. These registries give you an idea of what is appropriate to spend in the couple’s eyes. What’s the etiquette if there is no registry? The old rule of thumb was to pay for your plate. 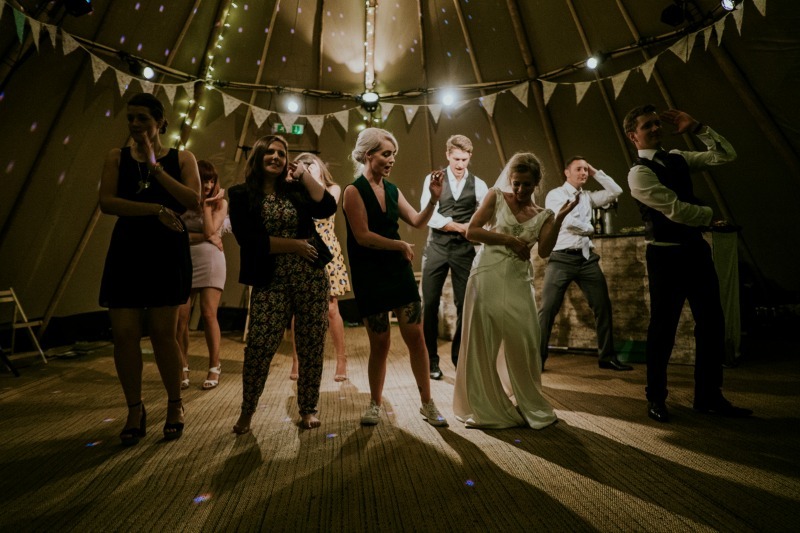 Consider the venue, price point, and how much the couple paid to entertain you at the reception. Generally, though, $100 is a good gift if you’re a family member or close friend. If you are bringing a large immediate family to the reception and have the means, giving up to $200 would not be inappropriate. Co-workers can probably get away with less, but don’t dip below $50 if at all possible. If your finances are tight, don’t overspend just to impress. If this is a good friend or family member, they’ll be grateful for the gift and understand your situation. If not, they might not be as good of a friend as you imagined. When your money’s tight, check out their department store or other registry if they have one. Often there are smaller ticket items on there that look better wrapped up than a small-ish check. Fifty dollars is still a good threshold, but again, do what you can afford. Writing checks to and from couples is an aspect of personal finance that can be pretty confusing. Nine times out of ten a bank clerk, in person or remote, will let errors slide. But if you catch that one ultra-scrupulous teller, your check is worthless. Unless the bride and groom are incredibly close with you, it can be tremendously uncomfortable for them to ask you to rewrite the check, making your gift null and void. Here’s a list of to-dos and to-don’ts to make sure everything goes smoothly. Write “Mr. & Mrs. Smith.” You need to use first names. You don’t need to write any titles such as Mr., Mrs., Ms., etc. Write “and.” For example, you shouldn’t write: “Mary and John Smith.” This is only appropriate if they have a joint bank account, and that’s most likely information you’re not privy to. If it’s a check for a wedding, don’t write it out to the bride’s new name; she can’t change the name on her accounts until after the wedding, so this may delay or even prevent her from depositing the check. She may not even take her partners’ name at all. Instead of writing “Mary and John Smith,” write “Mary or John Smith.” By writing “or,” either Mary or John can deposit it, regardless of whether they have joint or separate accounts. Write checks out to the bride’s maiden name. You can include a note on the memo line to clarify the gift is for both of them if you feel it necessary. Print your name on the signature line. Sign both your names on the signature line. It’s unnecessary, and is likely to get the check turned down at the bank when they try to cash it. Sign your name. In cursive. Even if it looks like a six-year-old did it. Sign ONLY ONE of your names. It doesn’t matter if you share a bank account or not. If you are trying to make it clear that the gift is from both of you, include a card with both your names on it. If you really want to emphasize the point, put something like “From Brooke and Nina” on the memo line. 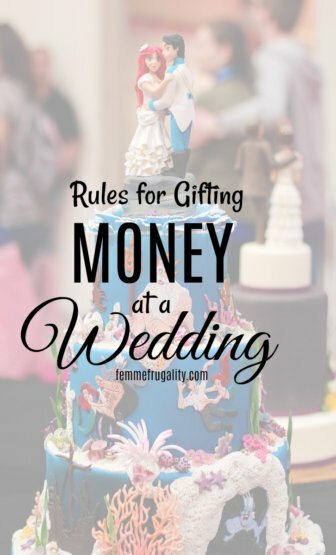 This entry was posted in Money Management, Wedding on a Budget on August 16, 2017 by femmefrugality. What’s My Best Path to Wedding Savings? We have something different lined up for hump day this week. Femme, by different do you mean amazingly fun? We’re in the thick of wedding season, and while my three-year wedding anniversary has come and gone, I still get a lot of inquiries on my wedding posts. So many, in fact, that I’m lucky enough to create new content around it every once in a while. 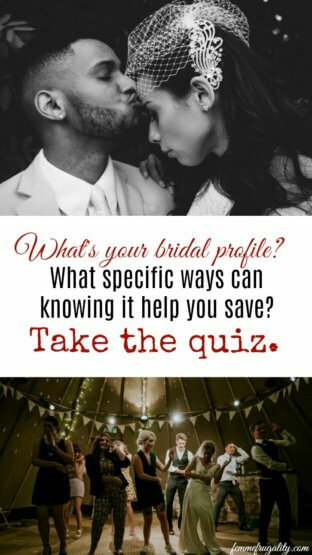 Today, I thought it would be fun to put together a little quiz to see which kind of bride you are (or were,) including tips on how you, specifically, can save money on the big day and make smarter spending decisions. I’m including all the results and resources below, giving you a way to view additional content if you’re not 100% happy with your results. Take the super fabulous awesome quiz. Read your results and get your free resources. Come back and let me know if you think your results were a good match or not by leaving a comment. Men, you can do this, too. It’s aimed at brides because this is primarily a women’s finance blog, but there aren’t any questions about dresses or corsets. I promise you’ll be fine. Make your own quizzes here. 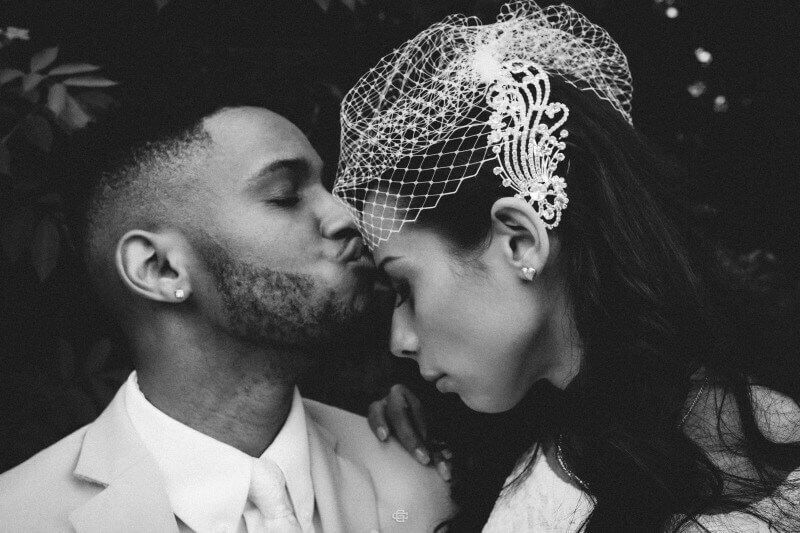 You want your big day to be about you and your partners’ love—nothing else. And we think that’s beautiful. A nice side effect is that you’ll run into a lot less planning stress. And need a lot less money. RESOURCE: Save money on airfare by getting married quickly at the East Coast’s Vegas. You only plan on doing this once, and you want to do it right. You want to get married to the (wo)man of your dreams, and you want to do it at a place of your choosing. 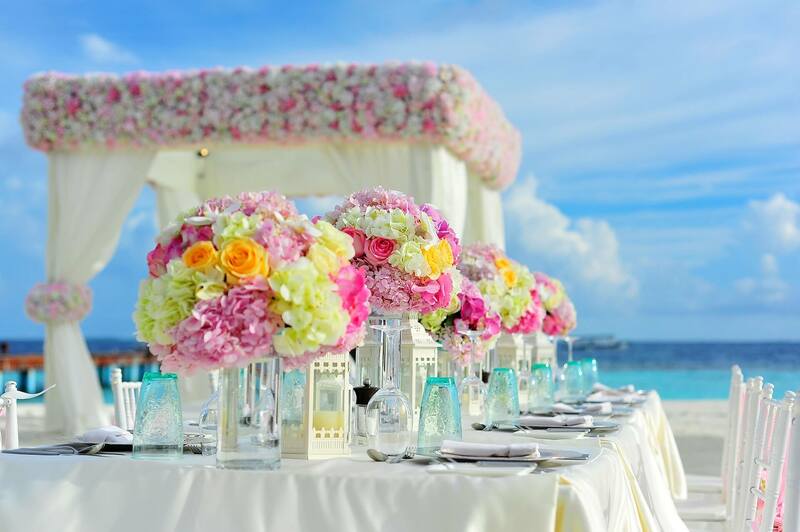 If you have a destination wedding, you’ll have to consider your family members’ ability to travel, both through the lens of health and finances. Destination weddings aren’t as expensive as you’d think they might be. In fact, places like Sandals give them away for free routinely. No, you don’t have to enter a contest. No, you don’t have to give up your first-born. All you have to do is book three nights at one of their resorts, and then you get a free wedding including venue, flowers, and cake. You have to pay for the officiant and the processing of paperwork, but everything else is taken care of. Then, if you have family members coming in, you get your room for free when you bring guests. The number required is different for different times of year. September 1 through Christmas your room is free when you have at least five guest rooms booked. January 2 through August 31 you have to have eleven guest rooms booked, and then yours is free. Free wedding. Free all-inclusive honeymoon. Pretty sweet deal. You can learn more about the deal here. You buck the norms at every turn, so why should your wedding day be any different? You know that the most impactful way to cut your costs is to limit your guest list, so you only invite who’s really important. Your venue choice is likely to be outside the norm, and you dress however the heck you want–even when you’re walking down the aisle. RESOURCE: Get married without an officiant–not even a judge. Just the two of you professing your love and commitment to one another. 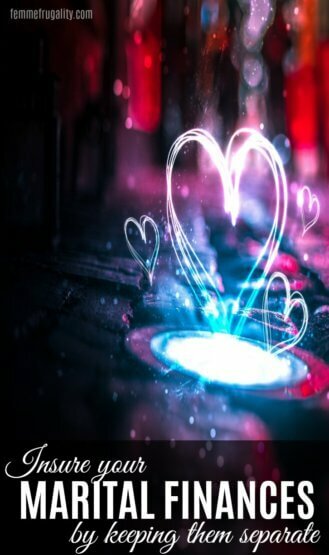 You and your partner love and respect each other in every aspect of life: as lovers, as friends; professionally and spiritually. Your big day will represent that deep mutual admiration with class from the dress to the venue. Class can get expensive, though. 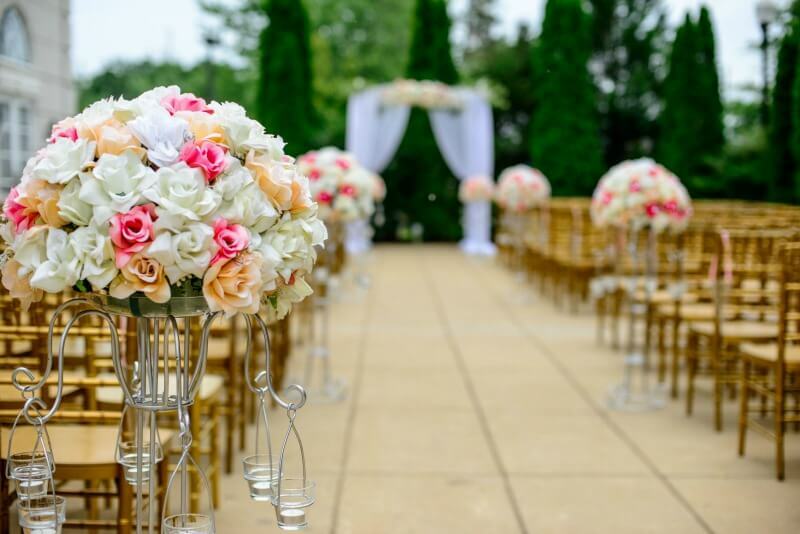 Don’t be afraid to get outside of metropolis areas when searching for your venue to save some cash, and remember that everything is negotiable. RESOURCE: Cut your catering costs with these veteran tips. You are a bride on a mission, and that mission is SAVINGS. You’re willing to craft, call in favors, and even borrow your sister’s wedding dress in order to make your big day happen. You’re smart for doing so, as you’ll be able to use all that extra money for other financial goals like buying a house or starting a family. Just be sure to run your numbers before you start that next DIY project. Surprisingly, sometimes paying someone else ends up being cheaper than doing it yourself. RESOURCE: Make your own free, printable place cards for the reception. Decorum and tradition are important to you. Your partner may have asked for your hand, and you plan on getting married in a church (or other place of worship.) 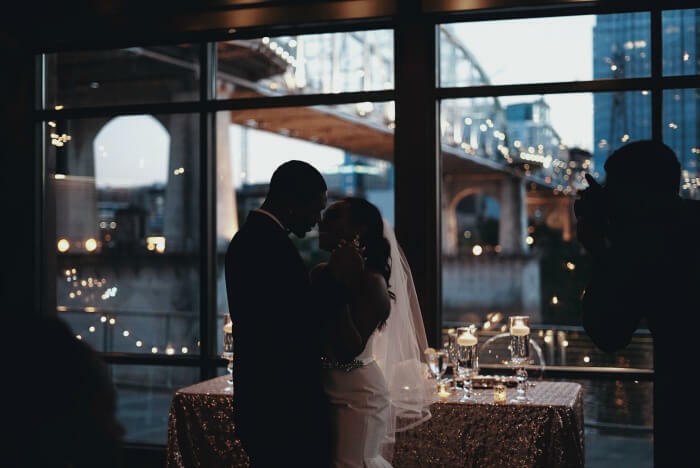 Your reception may or may not be opulent, but there will definitely be a three-course meal and dancing. Following tradition, your parents may be paying for some part of your wedding, though you’re likely making a big fiscal contribution. This is your big day, and a big day for them. While that may make planning a little heated at times, in the end, you’ll figure out a way to make it beautiful for everyone involved. You’ve been planning this day since you were a little girl, and mom and dad did not disappoint. They’re following the tradition of paying for your wedding, and you are all lucky enough that they have the means to do so in a big way. A great way to thank them is to point out different ways they can be smart with their purchases–and assure them you won’t mind that they’re cutting dollars out of the budget. This entry was posted in Wedding on a Budget on June 21, 2017 by femmefrugality.